APEC Expert Committee for E-Commerce Business Alliance held its 2017 annual conference on 16th December, 2017 in Maison Albar Hotel, Chengdu, China. 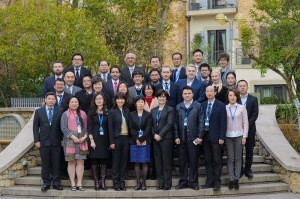 The conference was hosted by China International Electronic Commerce Center and APEC E-Commerce Business Alliance Secretariat, organized by China International Electronic Commerce Co. LTD and Intelligence Industry Committee of APEC-ECBA, and supported by Asia-Pacific Economic Cooperation (APEC) and Ministry of Commerce of the People’s Republic of China. APEC Research Center for Innovation and Development of Cross-border E-Commerce, Chengdu Chengshi Culture Communication Co. LTD. and Sichuan Haidiya Technology Co. LTD were the co-organizers. 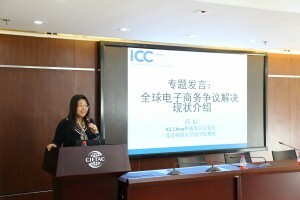 Prof. Xue gave a keynote presentation at the Conference on Chinese Draft E-Commerce Law and highlighted the key characteristics of the upcoming new Law that will be essential for the development of digital economy in the world as well as in China. Prof. Xue also actively took part in the expert discussion on global inclusive trade and pointed out that trade should not only benefit all the stakeholder involved (inclusive of currently disfranchised MSMEs, women and LDCs) but low or even eliminate barriers for accessing the global market. E-commerce’s potential to enable any business to access the borderless global access should not be reined by the traditional regulatory measures on exports and imports. New trade facilitation mechanisms, such as the enabling cross-border paperless trade through the UN Framework Agreement in Asia the Pacific , should be implemented for e-commerce and digital economy. Arbitrary distinctions and compliance measures (between goods and items or traders and buyers) should be reformed. Unification, simplification, digitization and automation should be the trend of development.